When IPC launched Speed in 1980 I must admit I was a bit cynical about it. The tone and look of the comic seemed to be a step backwards from what we'd seen with Battle, Action, 2000AD and Starlord. Maybe it was, as it only lasted for 31 issues before merging into Tiger. However, its run was interrupted for several weeks due to industrial action, which clearly didn't help sales. Looking at it now, it's not a bad comic at all. Solid storytelling and great artwork. Speed was obviously intended for a slightly younger reader than some of IPC's other boys' comics and there's nothing wrong with that. (I was 21 at the time so didn't appreciate it in the same way an 8 year old would have.) I would still question the absence of credits on the stories though. That was definitely a step backwards, considering 2000AD and Battle were both running credit boxes by then. One of the standout strips in Speed was Journey to the Stars, with glorious colour artwork by Ron Turner. Pretty much inspired by 1960s TV show Lost In Space, the Redford family find themselves trapped on an unknown planet and encountering various beings and dangers. Here's a couple of sample strips I'm showing today. 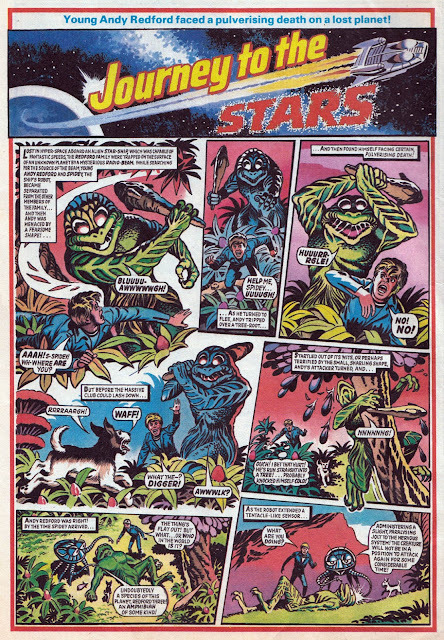 The episode above is from the issue dated 15th March 1980, and the one below from the issue dated 5th April 1980. 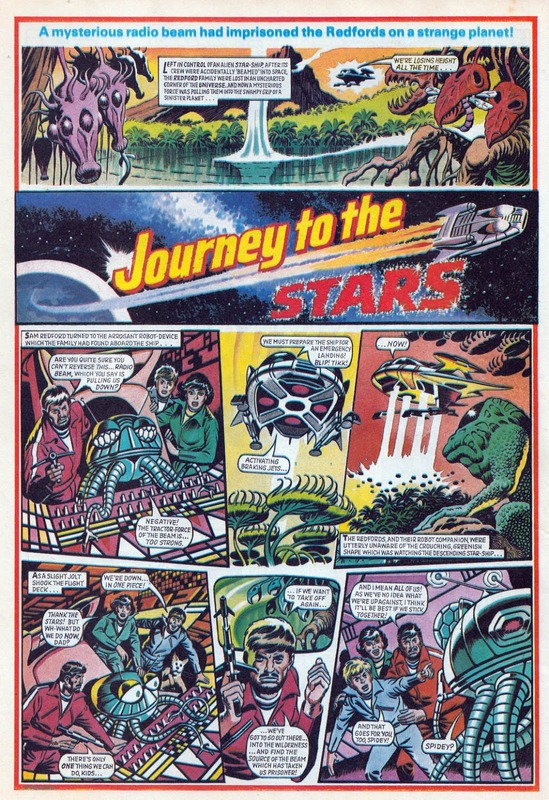 Now that Rebellion own Speed and its strips, perhaps we'll see Journey to the Stars reprinted one day. It's probably too young in tone for the average comic fan but I think it'd make a nice book for children. What do you think? All I remember of this is its opening installment, in which the aliens were terrified by a tiny pair of pet mice. "Bug-eyed monsters in mortal fear of Earth animals" seemed to be a favourite plot point! Turner's style here reminds me of Ken Stacey a little. Thanks for commenting. I don't think I have issue 1 now. I sold off my Speed collection years ago but bought these two recently for 50p each. I know later issues went to cheap newsprint so sadly that meant the end of painted strips. Nice looking artwork. Did the artist do anything for Eagle? The style looks sort of familiar? I can try to comment if you want me to, but I won't promess it'll be interesting :) The artwork is gorgeous as usual, Ron Turner was very talented indeed. What's striking me is that everything look like toys : spaceships (of course), robots, monsters... 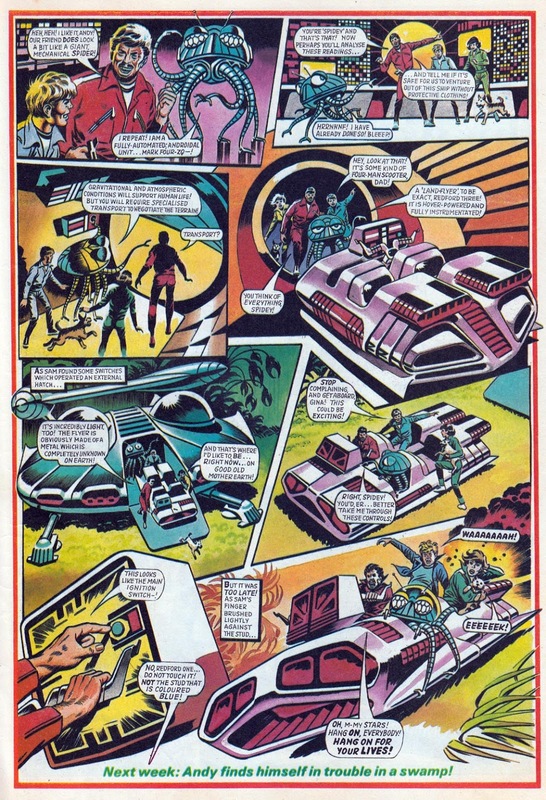 There is a plastic-like quality enhanced by the bright colors, something that can be found in Thunderbirds comics (including Turner's). Of course it fits just well in a magazine for young children. That's a good point about the toy look, Roberto. I suppose we're used to real spacecraft being more "weathered" and practical but Ron started drawing comics in a time when the sleek, shiny look was the ideal and I guess he stuck with it. He may have done stuff for the 1980s/90s Eagle, Big D, but not for the original Eagle as far as I know. He drew a lot of UK comics in his career though, going back to the 1950s. I've shown quite a few here so you must have seen them. Ron Turner - another of my favourites. From Rick Random to Journey To The Stars (my reason for getting Speed). 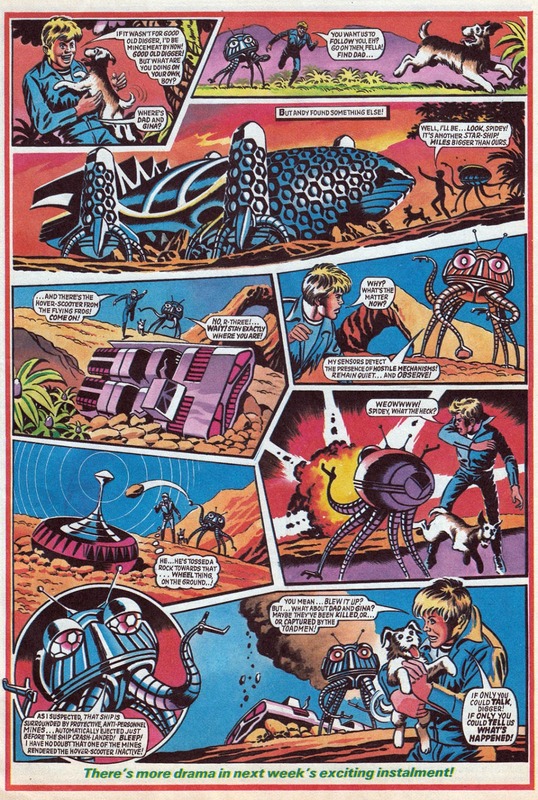 I've always liked Ron Turner's artwork, so I hope Rebellion might consider reprinting the full story as you mentioned. If Rebellion also own 'Whizzer and Chips', I'd especially enjoy seeing 'The Space Accident' and 'Wonder Car' again, well you never know. I bought quite a lot of Speed comics off eBay a few years ago and was impressed with this particular colour strip. But I would have loved to see Topps and Death Wish in colour as they were a lot more action-driven.